"Does our model of a free society still have a future?" - Atlantik-Brücke e.V. 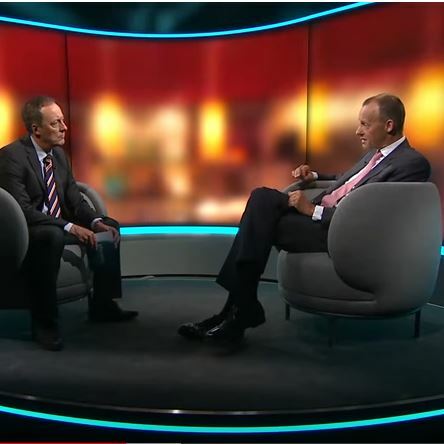 Interview with Friedrich Merz on "phoenix persönlich"
On June 22, Friedrich Merz, Chairman of Atlantik-Brücke, was interviewed on “phoenix persönlich” about Europe’s current relationship with the United States. Merz stressed that transatlantic cooperation is not an end in itself, but is proving indispensable, especially in a world in which authoritarian regimes are gaining more and more influence. Curbing their influence must be a common undertaking. Friedrich Merz gave an insight into the contribution of Atlantik-Brücke to maintaining the dialogue with the United States. He also underlined the importance of multilateralism for Germany and urged that the European project should not be given up. The complete interview (in German) can be seen here.